Well hello dear readers, it’s been a while hasn’t it?….For those of you who wonder where the heck I’ve been and why I haven’t been posting, my most sincere apologies. If it makes a difference at all, know that I have been using my time away from blogging in a very responsible way: I was studying. That’s right, these past couple of months were the last two of my Nutrition program. Good news is, I am officially done! Yayyyyyyy!!! (trumpets) I am now a Certified Holistic Health Coach! So exciting! And what better time to make a come back than spring?! Frankly, I couldn’t ask for a more perfect timing….I love this time of the year even without the excitement of being done school, so this is a wonderful little bonus! It’s sunny and warm out, there’s flowers in the yard, the garden is slowly growing, boating season is at our doorstep, oh my gawd, could I be more excited? I highly doubt it. Actually yes, I could be more excited, because it’s asparagussss season!!!!! I wait for these babies to grow for about 11 moths of the year, then I eat them every day for a month, and then boom, they’re gone. It’s kind of sad really. I kid you not, when I saw these at my local produce market, I let out a small scream. A couple shoppers turned around to look at me and I’m pretty certain they thought I was insane but I could not help it. I mean come on look at these beauties. 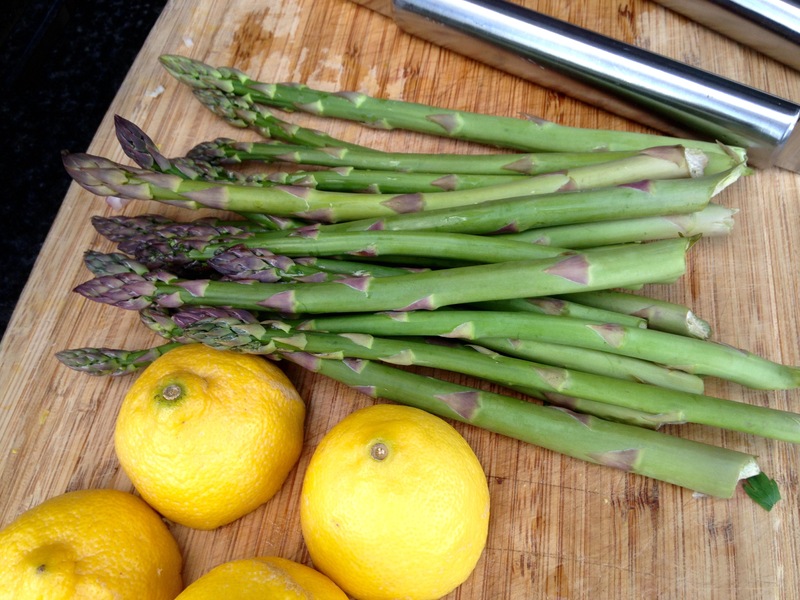 Another little bonus this time of the year; it’s time to start barbecuing! 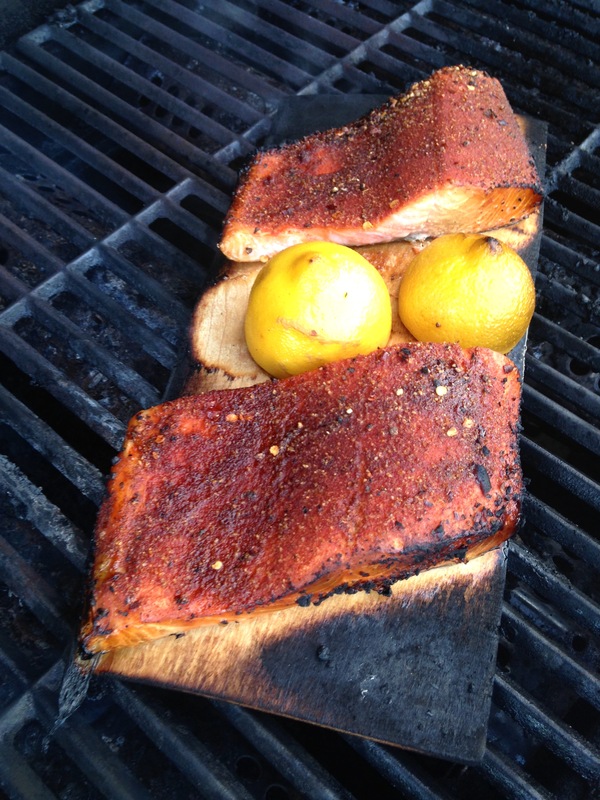 Cedar plank Salmon has to be one my favourite things to make on the grill, so I thought I would try a new recipe and share it with you. 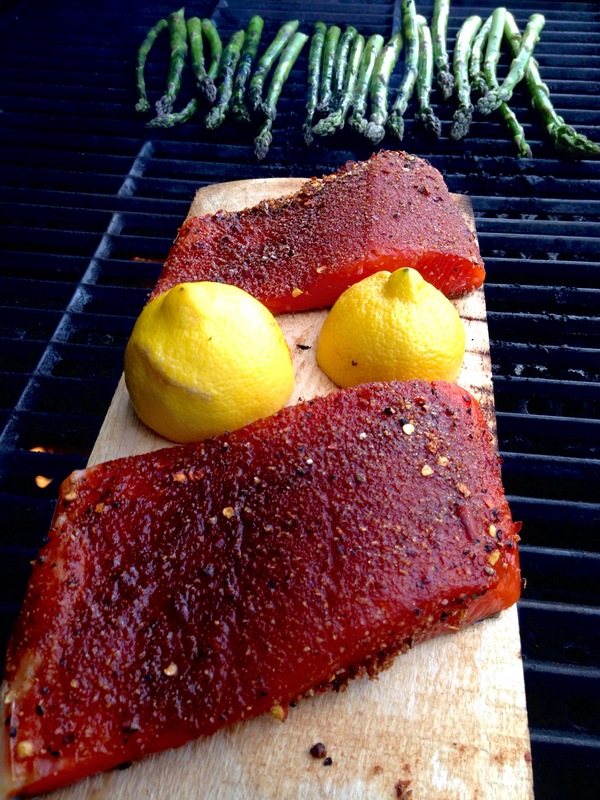 I typically have my go to marinade for cedar planking (is that even a verb?) but I just wanted a simple, sweet and spicy rub to enhance the flavour of the wood. Turned out really really tasty, partly because I got some fantastic Coho Salmon from my local fish store, but the rub really worked well (especially if you let it sit for a couple hours with the spices on). My only fail with this whole recipe is that the minute I walked away from the barbecue, I had a small fire situation to deal with as soon as I got back. There was a little bit of a panic in the house for a second as I ran across the living room screaming “fire” to grab some water. Thankfully, this small incident only seemed to have enhanced the flavour of the fish, and had given it a beautiful caramelized texture with only the edges being very slightly blackened. Yay! I may have wanted it a smidgen less done but it was still very moist inside. Cedar planking tip number one: stay posted to your station with a water bottle in hand in case it catches fire (it most likely will). Ps., I did soak my plank for about 4 hours prior to using it so I guess that would be tip number two: soak your plank, for at least a few hours. If you use a completely dry plank you may have a much bigger fire on your hands than I did. I made a sweet pea & spinach puree with this and some blistered tomatoes, yum! First things first, soak your plank baby! If you didn't read my blog post above, know that skipping this step might leave you with a fun little fire to deal with. Just let it soak for a few hours either in the sink or in a shallow dish. Then mix all the spices together in a small bowl, and pat each individual fillet with the rub, gently massaging the flesh. Let it sit for a while (at least 30 minutes). Now time to start the barbecue. Preheat the grill on high heat and place the soaked plank on the grill. Leave it on by itself for a few minutes or until it starts crackling. The plank should turn black. 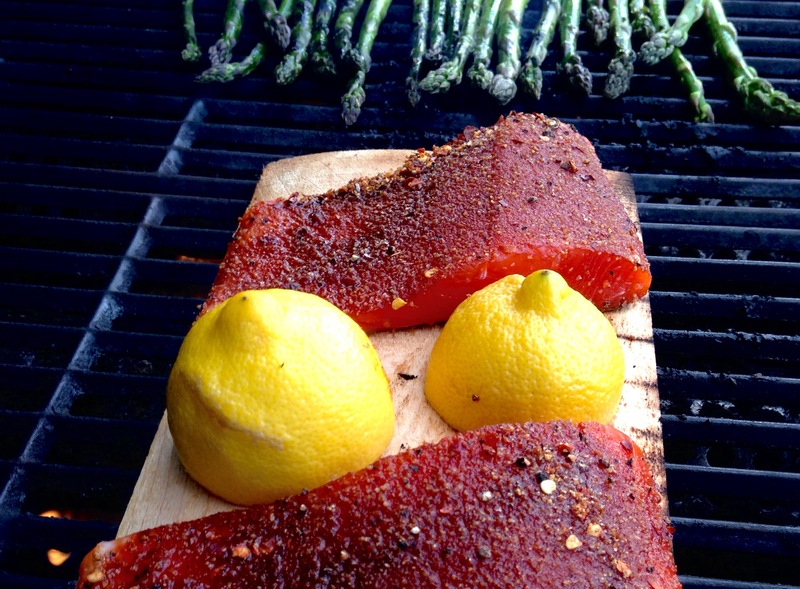 Flip the plank over and place salmon fillets skin-side down along with the lemon halves. A good trick with salmon (or any meat for that matter) is to remove it from the cooking surface when you think it needs about 1 or 2 more minutes. 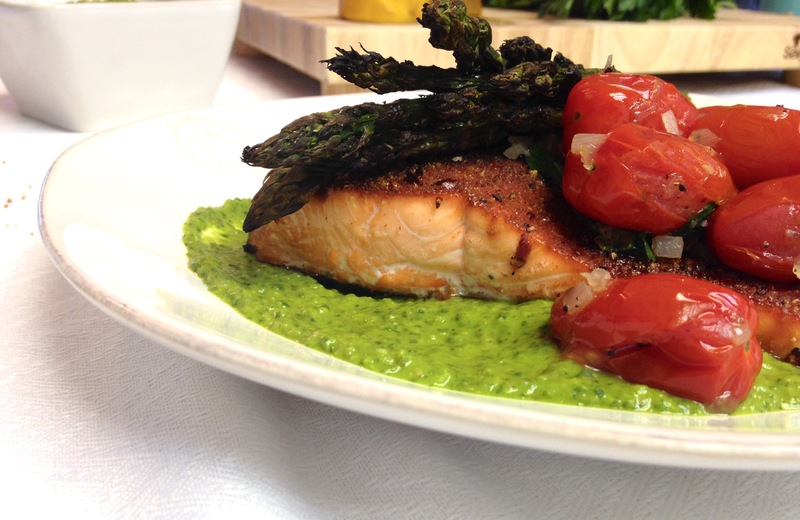 If anything salmon is better a bit underdone so remove it sooner than later.